The Ph.D Programme in Urban Planning, Design and Policy (UPDP) aims at providing analytical and interpretative tools, as well as research/planning/design methodologies, able to produce further advancements both in terms of theories and practices, in the field of spatial and land use planning, urban design, urban policies and governance. The PhD Program in Urban Planning, Design and Policy aims at exploring the significance and the impact of contemporary urban changes and at understanding the way they can be governed through planning, design and policy making activities. The program focuses on territorial, social, economic and institutional transformations in contemporary cities, and aims at discussing them as a complex of intertwined phenomena, which calls for new governance, planning and design approaches.The integration between different fields and disciplines of urban research on the one hand, and between theory and practice on the other one, distinguishes the approach promoted by the PhD program. By establishing a dialogue with the best European and International schools, this PHD program is the place for research and innovative approaches to urban studies, spatial planning and urban design. PhD Students are encouraged to reflect upon traditions and innovative experiences in these fields, to participate to research activities concerning cities and regions in Italy and abroad, paying particular attention to international comparison. This will be fostered through the organization of international seminars and through a period of internship to be carried out by the PhD Student at those research institutes, universities or public agencies which constitute the international reference network for the UPDP Program. On the basis of a multidisciplinary approach, the main objective of both the educational program and the individual research activities is to offer to PhD students a challenging environment, a space for international debate and research, experimentation and innovation. • Design topics, forms and tools. These research areas reflect the contents and themes of the ongoing research at DAStU and represent the framework of future proposals. They will be the backbone for PhD Students educational and research activities. • Forms and processes of spatialisation of social and economic inequalities. 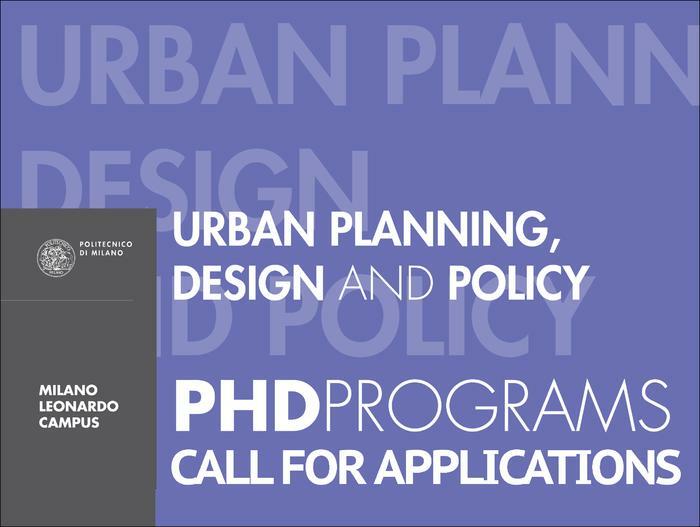 • The PhD Program in Urban Planning, Design and Policy welcomes foreign and Italian students. • English is the official language of the program. The PhD Program takes advantage of the rich research milieu of the Department of Architecture and Urban Studies (DAStU) and of the cooperation with two other PhD Programs held at DAStU (Architectural and Urban Design and Preservation of the Architectural Heritage). • All candidates will be admitted with the basic departmental scholarships, and the specific research subject will be assigned, with the agreement of the candidate and the Board of Professors of the PhD Programme, within the first years of the PhD activity.